Get vertical, Get stylish! Our EcoRest made of solid wood gives your MacBook a save and eye-catching home. Functionality meets Design: You want to use your MacBook for a Dual-Desk-Setup but get easily annoyed by the space that it takes away from your desk? You want to charge your Notebook but it is always in the way? Well, here you go: Our newest Dock is designed to reduce the footprint of your MacBook to a minimum. It transforms your laptop into a space-saving desktop. The wooden laptop dock works as an Arc for your Mac, you just fold it up and slide it into the wooden dock. Get stable & stylish at the same time! The minimalist design is one-of-a-kind and upgrades your desk to a new level. 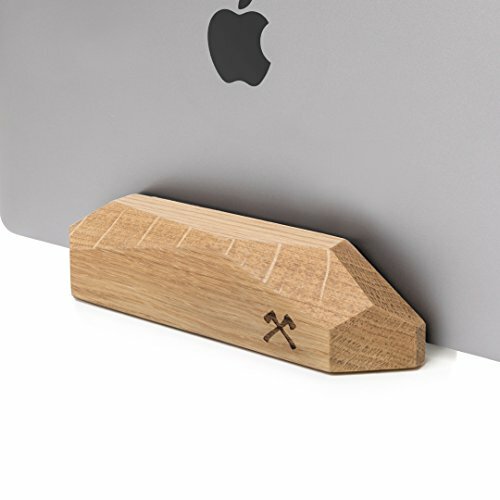 Designed for our Premium Set Up Collection the MacBook Dock is available in rich walnut and oak wood and with its hexagonal corners it fits perfectly into our high-end desk-set. It is equally ultimately compatible (with all MacBooks Air & Pro sizes and usable with MacBook (12) when adding attached felt strips), handcrafted from solid wood and one-hand-operative thanks to suction pads on the lower surface. Of course, you get a small guide with your handcrafted, personal unicum to prepare you for all your desk-adventures! Take care of your MacBook with our new Arc and not only save space but put it into the right light! Each piece has a natural, unique look telling its own story. We hand-pick & re-purpose the wood to bring each customer a one-of-a-kind companion.